Flat fees vs hourly billing in your divorce case? I know there are several divorce law firms in my market do only hourly billing for their clients. I know that there are many more that do only hourly billing. And then there are a few, (mine included), which take a hybrid approach and do a little bit of each. Flat fees vs hourly billing is a debate that is not going away anytime soon. Before I get into the approach we have chosen at The Hart Law Firm, let me explain the pros and cons of hourly vs. flat fees, as I see them. Hourly billing is where a client pays what is typically referred to as a “trust deposit” or an “advance fee” that is then deposited to the lawyer’s trust account (aka IOLTA account in North Carolina). The lawyer bills an hourly rate (somewhere between $175 to $350+ per hour) and submits an invoice to the client periodically. (We send out invoices electronically, once per month). The client can either pay the invoice or, if they don’t, the law firm will deduct the fees owed from the amount being held in trust for that client. The client only pays for the work that is done on the file. If a certain case has a lot of uncertainty to it, the law firm does not have to worry about under or overestimating its fees because they are billing hourly for the actual time spent on the matter. The client doesn’t know what the overall fee will be when they hire the firm. It costs the firm a lot of administrative time to make sure all the time on a case is captured, and billed to the client. The firm must manage a trust account to keep it reconciled and conforming to bar rules. Preparing the bills themselves takes a lot of administrative time. The law firm’s incentive is to bill as much time to a file as it can, so that it can make the most amount of money per matter. The client has a disincentive to contact the firm when there is a problem, or else they will get billed for that time. Flat fees are fees that a client pays up front to a law firm to handle a certain amount of legal work on their behalf. If the matter requires additional work beyond the scope of the first fee, then the client is asked to pay an additional fee. The client will know, up front, exactly what their legal fee will be for the law firm to see their case through to trial. The law firm collects the entire fee up front and does not have to place any of the funds into it’s trust account. The law firm is incentivized to handle the matter quickly and efficiently, closing the file out as quickly as possible. The interests of the client and the lawyer are aligned. 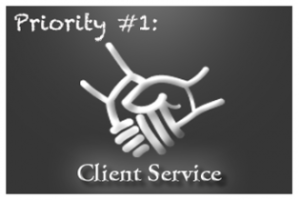 The client does not pay extra for phone calls, emails, or meetings. There are no administrative costs related to tracking time or billing the client on a monthly basis. (Although I will frequently track my time anyway just so I know how much time I am spending on a given case). Because of the inherent uncertainty and risk that the law firm takes when charging a flat fee, they tend to be higher than if the law firm merely collected a trust advance. (i.e., if a law firm may collect a $5,000 trust advance on a certain matter, that same matter may require a $7,500 flat fee). Other law firms could, theoretically, use the knowledge that you charge flat fees against your clients when negotiating a resolution to a case. So what type of fees are charged at The Hart Law Firm? I said previously that took a “hybrid” approach to legal fees. Many of our clients pay on an hourly basis, and I would say that hourly billing is typically the default for most divorce law firms in North Carolina. Certain clients, however, are just a better fit for flat fees. These clients usually have a budget for their legal fees that they don’t want to exceed. As a result, they like the certainly that comes with a flat fee. We have adopted a minimum fee for most contested cases. This is a hybrid between flat fees and hourly fees. We charge a minimum amount on each contested case, and bill against that fee. Once the fee is exceeded, we will either negotiate a new fee with the client, or continue on an hourly basis if there is a very little amount of work left to do. However, if we finish the case before the fee is reached, our firm earns the entire fee. A minimum fee gives our firm an incentive to get the case done quickly, which aligns with your interests. And because we are protected on the upside, we can charge less for these fees than if we were billing on a flat fee basis. Certain matters, such as absolute divorces (where the divorce is the ONLY issue), uncontested separation agreements, qualified domestic relations orders, and other simple matters will be charged on a flat fee basis. In addition, we charge a flat fee of $250 for the first hour of each divorce assessment, or $350 if we go longer than an hour. (most assessments last between 60-90 minutes). That’s basically it. If you have questions, or would like to talk about how we might structure the fee in your particular case, please give us a call at (919) 883-4861 to schedule an initial consultation with our firm. You may also fill out our contact form here.